Our beautiful conservatories come in a wide range of styles, including: Victorian, Edwardian, Lean-to, Gable and P-shape designs. Our planning and design team are ready to assist you with whatever you need in order to achieve your dream conservatory. Highly experienced, they will offer their extensive knowledge and present you with a detailed Conservatory plan. Browse through our stunning collection and choose a design which will complement your home, we have a Conservatory to suit every style of property. Bring a classic touch to your home with the Edwardian Conservatory. Influenced by the Edwardian architectural style, this flat-walled design combines bold symmetrical lines with fine decorative touches. This beautifully understated design will blend seamlessly into your home, complementing your property rather than overshadowing it. 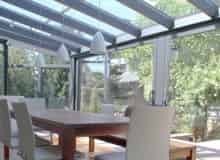 Featuring a pitched glass roof, this conservatory allows natural light to abundantly flow through into the building – creating a bright and warm atmosphere. Square or rectangular in shape, this style will grant you with generous floor space. Perfect for the layout of plants or furniture, this conservatory design will provide you with the extra indoor space you need. Contact us on 01227 779372 where our friendly advisors will be happy to help with your Edwardian conservatory enquiry. Monuments to our British heritage, gable conservatories remind us of an extravagant bygone era which brought us many classic pieces of architecture. Influenced by the Georgian architectural style, the gable conservatory is extremely elegant in appearance. Enhancing their stately feel, the gable is particularly well suited to older style properties however it will undoubtedly bring a touch of class to any style of property, modern or old. A gable conservatory can be installed within many different properties due to its adaptable design. Square or rectangular in shape, the gable will allow you to make the most of available floor space, whilst its vertical roof design will capture all available sunlight. Aesthetically popular, the gable conservatory can be seen in many properties throughout the UK. Available in a range of decorative finishes, the gable can be designed to meet your particular needs. For example, many homeowners choose a sun burst effect (image of a rising sun) to have at the front of their conservatory whilst others may choose simpler and subtler styles. Contact us on: 01227 779372 and our friendly advisors will be happy to help with your gable conservatory enquiry. Classically British, the Victorian conservatory is elegant in style and can be adapted to suit any style of property. This traditional design looks great within Victorian properties, with its high class features enhancing their period aesthetics. Not only suited to Victorian style houses, this conservatory will also bring a sense of individuality and charm to newer properties. 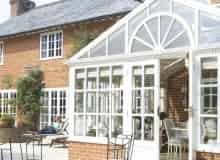 Victorian conservatories are perfect for maximising space and are Ideal for homes with smaller gardens, with their rounded edges blending seamlessly into your property. Whatever your property style, the Victorian can be designed to meet your needs. Available in a variety of colours and finishes, our beautiful Victorian conservatories will be designed to suit your personal preferences. Contact us on: 01227 779372 and our friendly advisors will be happy to help with your enquiry. Simplistic in design, the lean-to conservatory is perfect for properties restricted by height. Its low pitched roof is ideally suited to tight and small spaces, making it perfect for bungalows and terraced houses. If you are a person who prefers subtler designs, then you will be inevitably drawn to the lean-to’s contemporary style. Aesthetically similar to a Mediterranean sunroom, the lean-to features clean symmetrical lines which will blend seamlessly into your property. The lean-to will enhance the character of your property and will complement its existing style rather than over shadowing it. This understated design can be tailored to suit your personal preferences, and is available in a wide range of colours, styles and finishes. This versatile conservatory will allow you to create the living space you desire. Whether it’s for a greenhouse, dining room or lounge, the lean-to provides you with many different living options. Contact us on 01227 779372 and a friendly member of our team will be happy to help with your lean-to enquiry. Secure Style Windows provide superb custom conservatories meaning you can tailor your conservatory to your own specification. All our conservatories are bespoke products that are designed to complement our customers’ properties but if you are looking for something that little bit different then get in touch. We believe in providing complete customer satisfaction and will schedule a free consultation with you to discuss design ideas and conservatory options. We will take the time to listen to your individual needs so that you get the dream conservatory you have always wanted. Custom conservatories are the ideal way to put your own stamp on your home and indulge your personal tastes and style preferences. 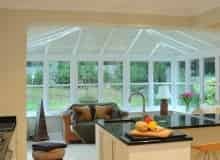 Whatever design you have in mind we are confident we will be able to meet your needs as we are experts in the design and build of custom conservatories. There are many benefits to extending your home with a custom conservatory. You will gain a valuable multi-purpose living space to enjoy for many years to come. 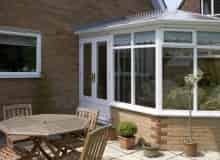 If you would like to speak with an advisor regarding a custom conservatory or would like to schedule a free consultation please call us on 01227 779 372. Alternatively, you can submit an enquiry online and one of our friendly staff will get back to you. 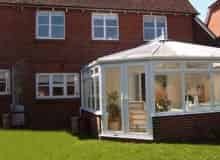 Hipped conservatories are an excellent option if you are looking for a sleek and attractive way of extending your home. The base and walls of a hipped conservatory are that of a traditional design such as an Edwardian or Victorian conservatory but it is the unique ‘hips’ that provide its individual look. What this means is that the roof of the conservatory is pitched on all sides meeting at a central ridge. This distinctive style gives a real feeling of space from within the conservatory and a unique and elegant appearance from without. Secure Style Windows have many years experience of designing and building hipped conservatories and we offer all our customers a free consultation to discuss styles and designs. We take the time and care to ensure that the conservatory you decide upon complements your home and best utilises the space you have available. 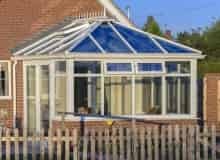 Hipped conservatories are a popular choice with homeowners who are looking for a traditional design with a subtle twist. They are attractive, durable and will give you years of enjoyment. 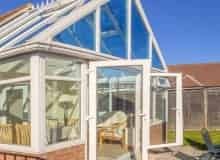 For more information on hipped conservatories, or any of the other conservatory styles we offer please call us on 01227 779 372 to speak with one of our highly trained staff. Alternatively, you can contact us online and we will endeavour to get back to you as quickly as possible. If you are looking for an eye-catching new addition to your property, a gull wing conservatory could be the perfect solution for your home. The distinctive lines of the Victorianesque roof combined with the unique corner design make the gull wing conservatory a true original. Gull wing conservatories are the ideal way to extend your home if you are looking for a conservatory design that is both modern yet elegant, grand yet refined. The uniquely angled roof of a gull wing conservatory provides a stylish and contemporary look which may be the perfect choice for the homeowner looking for a design that is elegant yet less traditional than a Victorian conservatory. The gull wing conservatory also offers a more intricate shape and style than an Edwardian or lean-to conservatory meaning it is an ever-more popular conservatory option. Gull wing conservatories suit the majority of properties and will optimise space well whilst adding a real touch of character. 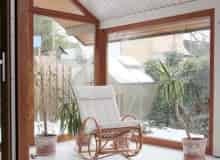 Like all UPVC conservatories they also offer excellent energy efficiency and are low maintenance giving you more time to sit back and relax. Secure Style Windows specialise in the design and build of gull wing conservatories and we will be happy to give you a free consultation to discuss styles and possibilities. P-shape conservatories offer a unique design which is influenced by the lean-to and Victorian styles. These classic styles are used in an innovative design which culminates in the P-shaped conservatory. Combining the lean-to’s simplistic groundwork and the Victorian’s aesthetic flair, this conservatory will provide you with extra floor space, allowing you to create two separate living areas. The P-Shape essentially provides you with two extra rooms. The P-shape conservatory is excellent for maximising space within your property. Its clever design provides you with the extra space you desire, without taking any space away from your garden. Projecting outwards from your property, the P-Shape’s impressive structure is perfect for larger, detached properties. This versatile style can either be three faceted or five-faceted. Contact us on: 01227 779372 and our friendly team will be happy to help with your enquiry.